We extend our thoughts and prayers to the many injured and to those who lost friends and families in the tornados this past week across the Southeast. It is important to focus on these communities now, particularly as the news cycle moves to other news. It will take months for these communities to recover, so long-term focus and attention will be important. 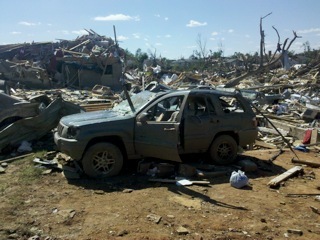 Relief agencies such as the American Red Cross are responding with significant resources. They depend on donations, which you can contribute here. The National Voluntary Agencies Active in Disaster have engaged (and we are standing up a site for their work in Alabama), as are the members of the Coordinated Assistance Network. We are proud to support technology for each of these relief networks. Friends and family can find one another at Safe and Well, and can check the status of local shelters here. In addition, iPhone users can download the free App, Shelter View, for shelter location maps, and shelter status and availability. An event of this magnitude reaches out to many. In fact, the nephew of one of our senior staff lost his home; it's as if the house was never there. While injured, he is going to be okay. This car is where the den used to be in the house, and at the left edge cars are falling into the basement. Storms remind us of the power of natural forces, and that only through collaborative efforts can communities regain their foothold after disasters and work to increase their resilience in advance.